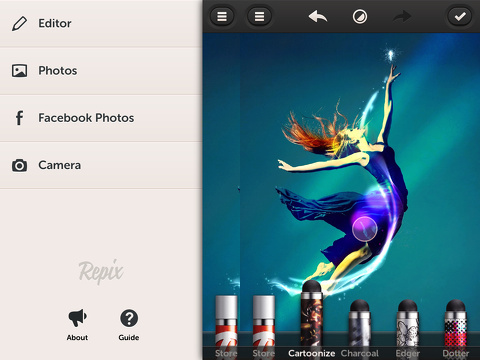 The Repix – Remix & Paint Photos iPhone, iPod Touch, and iPad photography app incorporates gesture-controlled photo effects, creative paint and texture tools, and fantastic sharing features. The smart interface and refined aesthetic perspective create a fresh, exciting experience with this free universal download. The Repix – Remix & Paint Photos iPhone app incorporates a sliding left menu to allow you to move seamlessly through the iPhone app. You can move with one touch between editor, camera roll, photo stream, Facebook photos, and in-app camera. You will be asked to authorize iOS and Facebook photo access. Once you snap or select a photo, you will want to open the editor interface. There is a top menu bar that allows you to undo and fast forward with a touch. In the top menu bar there is an icon that typically changes the light in iOS photography apps, but, in this case, it opens a list of photo editing tools. The final icon in the top menu bar is the check icon to save to camera roll; send by email; post to Twitter, Facebook, and Tumblr; and open in Instagram. The paint tools to adjust the texture of your photo are the ball point pens at the bottom of the screen. The free download includes 9 selections, as well as an undoer and eraser. It is cheeky and witty to call the tool an undoer, since iOS apps really do have their own language. 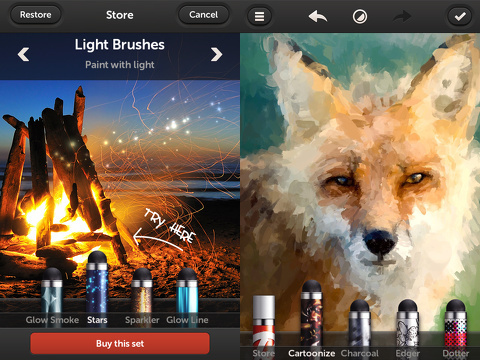 Additional paint tools are available for in-app purchase. To adjust the photo with the paint tools, you touch the pen and then rub on the screen with your finger. The paint tool choices are interesting and exciting. A charcoal pen smudges the edges. The edger pen accentuates and provides contrast to the edges. The silk pen softens and blends the colors. You touch the circle icon in the top of the menu bar to make additional editing choices. A list pops up with seven selections. The cropping tool shifts the photo to a new screen where you pinch and zoom to select the crop size. The other six features use horizontal gesture controls. A swipe to the right results in a bolder interpretation, and a swipe to the left moves the editing tool to the opposite end of the spectrum. The distance you travel is marked from -100 to 100, and 0 is your original photo. For example, the vibrance tool moves from black and white at -100 to a saturated, intense color at 100. Other tools include brightness, contrast, saturation, temperature, and vignetting. It is fun to work with these tools, then finesse it further in Instagram. The Repix – Remix & Repaint Photos iPhone, iPod Touch, and iPad app is superbly organized, highly intuitive, and, most importantly, produces chic, modern, and appealing iOS photos. AppSafari review of Repix – Remix & Paint Photos was written by Jenni Ward on March 19th, 2013 and categorized under App Store, Free, Fun, iPad apps, Photos, Universal. Page viewed 4217 times, 2 so far today. Need help on using these apps? Please read the Help Page.